That fuzzy sunset photo a couple of posts ago bugged me enough to (download and then) read the camera manual. Turns out, the problem was I had the “Servo AF” box checked. Go figure. Anyhow, I was on my way home from Melissi again last night when Hλιος (Helios, the sun god of ancient Greek mythology and the modern Greek word for sun) was standing on the horizon posing for his photo before retiring for the night. I went down on the beach at the Akrotiri taverna and grabbed these snaps of the Sikya cape. 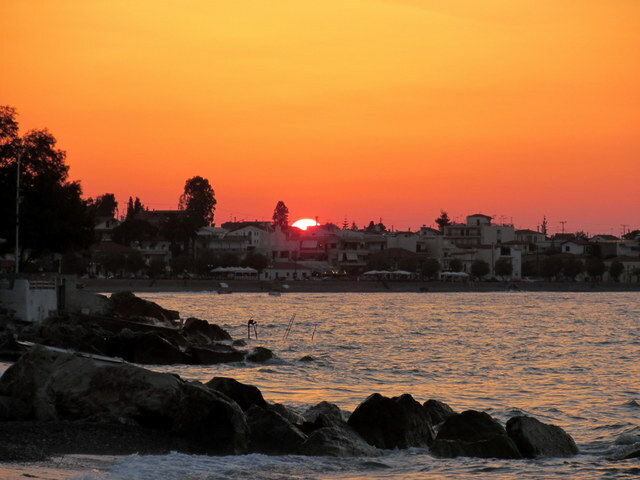 This entry was posted in Greece, Kolpos Korinthiakos, Peloponnesos. Bookmark the permalink. These photos are beautiful. It makes us want to climb on the next plane and go back to Greece. It’s a deal, come on over. The water’s now about 75deg.